Allowable Strength Design (ASD) involves eight basic load combination equations. 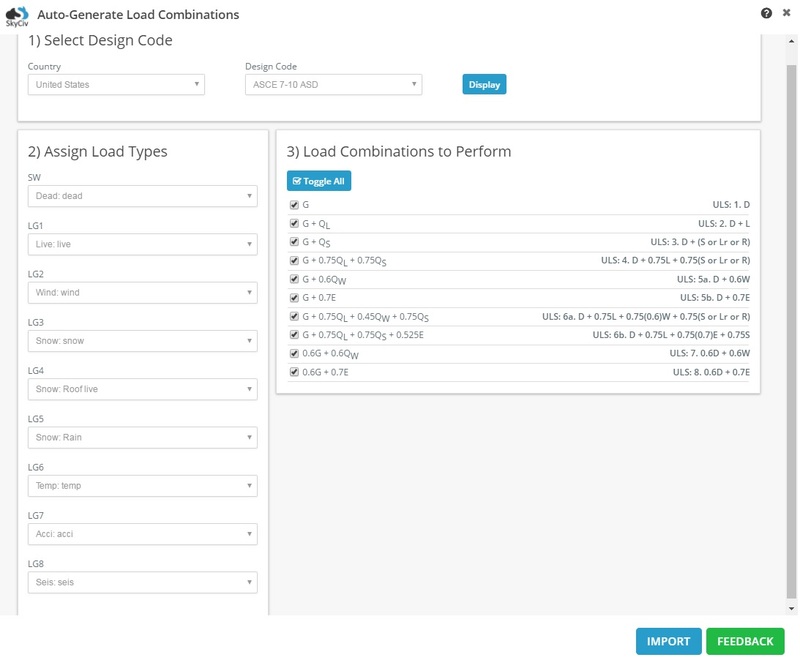 This article will focus on how SkyCiv’s auto generated load combinations feature meets the load combination equations as specified in ASCE 7-10 ASD. D + (Lr or S or R) Eq. 2.4.1.3 G + QS The load type QS "Snow" is sub-categorized into "snow", "roof live", and "rain". Selecting this load combination will automatically create 3 load combination equations due to the use of "or" in the equation specification. D + 0.75L + 0.75(Lr or S or R) Eq. 2.4.1.4 G + 0.75QL + 0.75QS The load type QS "Snow" is sub-categorized into "snow", "roof live", and "rain". Selecting this load combination will automatically create 3 load combination equations due to the use of "or" in the equation specification. G + 0.7E Due to the presence of an "or" in the load combination, two load combination eqations are required to represent them. Since "wind" and "seismic" are not linked by a load type, two separate equations are given by SkyCiv, instead of auto-generating equations in the case of the QS snow load type. D + 0.75L + 0.75(0.6W) + 0.75(Lr or S or R) Eq. 2.4.1.6a G + 0.75QL + 0.45QW + 0.75QS The load type QS "Snow" is sub-categorized into "snow", "roof live", and "rain". Selecting this load combination will automatically create 3 load combination equations due to the use of "or" in the equation specification. D + 0.75L + 0.75(0.7E) + 0.75S Eq. 2.4.1.6b G + 0.75QL + 0.75QS + 0.525E Only one load equation is required to represent this load combination. Despite the presence of QS "Snow" load type, only one equation is generated by SkyCiv for the "snow" sub-type.